This project (STE 41014, 52810A, STE 41401, 54905A) consisted of 0.34 miles of non-motorized trail and scenic beautification on US-131BR along Wealthy, Ionia, and Cherry Streets in the City of Grand Rapids, Kent County, Michigan. Driesenga & Associates, Inc. provided field inspection and materials testing, and maintaining project records utilizing Field Manager software to comply with Michigan DOT specifications. This project (STH 59051, 50766A, STG 59051 55587A) consisted of 0.50 km of bituminous cold milling, resurfacing, widening for intersection improvements and traffic signal installation, on M-66 at the Sidney Road intersection, in Sidney and Evergreen Township, Montcalm County, Michigan. Driesengaâ€™s role on the project included construction engineering and project management, field inspection and materials testing, and maintaining project records utilizing Field Manager software to comply with Michigan DOT specifications. This project (STH 59043, 50767A) consisted of 0.33 km of bituminous cold milling, resurfacing, widening for intersection improvements and traffic signal installation, on M-46 east and west of M-66 (west junction), in Belvidere Township, Montcalm County, Michigan. Driesenga & Associates, Incâ€™s work included construction engineering and project management, field inspection and materials testing, and maintaining of project records utilizing Field Manager software to comply with Michigan DOT specifications. This project required roadway improvements due to increasing traffic flows, and encompassed 0.25 miles of HMA widening for center left-turn lanes, right-turn lanes, curb and gutter, enclosed drainage and traffic signal installation, on M-44 at the Blakely Drive intersection in Cannon Township, Kent County, Michigan. Driesenga & Associates, Inc. provided construction engineering and project management services directly to Michigan DOT. Work included full time field inspection and materials testing, and maintaining project records utilizing Field Manager software to comply with DOT specifications. Safety concerns generated the need for overall improvements to 2.30 miles of M-20 in Goodwell, Big Prairie and Mecosta Townships, Newaygo and Mecosta Counties in Michigan. Design modifications involved super elevation correction, horizontal radius re-alignment and vertical alignment adjustments. Project work included HMA crushing and shaping, approximately 1,900 feet of roadway reconstruction, HMA paving, guardrail salvaging, culvert replacement and miscellaneous items. Driesenga & Associates, Inc. team members provided full Michigan DOT design engineering services including plan preparation, guardrail design, detour and maintaining traffic plans, special provisions and opinion of probable cost complying with Michigan DOT specifications. Michigan DEQ wetland permits were obtained for re-establishment of the roadside ditch and multiple culvert extensions in the Michigan DOT Right of Way. This project on US-131 involved deck replacement, pin hanger replacement, partial cleaning and coating of existing structural steel and structural steel repair on US-131 Northbound and Southbound over North Park. In addition, street and deck replacement, substructure repair and beam end repair were performed on US-131 Northbound over 6 Mile Road, in Plainfield Township, Kent County, Michigan. As a subcontractor to Anlaan Corporation, Driesenga & Associates, Inc. supplied contractor staking which included bridge footing and wall layouts, pier layout, slope staking, pavement layout, utility layout and as built topographic surveys. Interstate Highway Construction, Inc. sought Driesenga & Associates expertise for the US-127 freeway reconstruction project. The project consisted of 9.71 km (6.0 mi) of concrete freeway reconstruction, ramp improvements and traffic signal installation on US-127, from M-50 Northerly to the I-94 East junction. Substructure repair, cleaning and coating of existing structural steel on US-127 over M-50 and Conrail Railway was also required. In addition, substructure repair and beam end repair on US-127 under Page Avenue and structure replacement on US-127 under South Street and US-127 over Michigan Avenue in Leoni, Summit and Napoleon Townships, Jackson County, was required for this project. As a subcontractor to Interstate Highway Construction, Inc., Driesenga & Associates, Inc. supplied contractor staking which included slope staking, pavement layout, utility layout and ramp extensions. This projected included substructure replacement, widening and substructure repair on I-94 over US-12. Also required deck replacement, widening and substructure repair and partial painting on I-94 over Conrail and Amtrak Railroads, in New Buffalo Township, Berrien County, MI. As a subcontractor to Hardman Construction, Inc., Driesenga & Associates, Inc. supplied contractor staking which included: bridge footing and wall layouts, pier layout, slope staking, pavement layout, utility layout and as built topographic surveys. 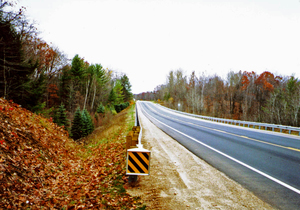 Project: Various Road Reconstruction Projects - Allegan County, MI. Driesenga & Associates, Inc. has worked on a number of road reconstruction projects for the Allegan County Road Commission. Examples projects are 28th Street, 121st Avenue, 144th Avenue, 25th Street, 32nd Street, 138th Avenue, 43rd Street, and 127th Avenue. 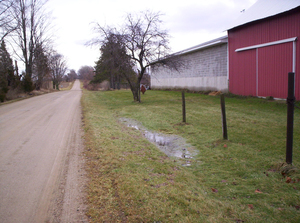 The projects generally entail upgrading an existing gravel road to an all season paved road. The proposed new design is required to meet an AASHTO 55 mile per hour design speed for horizontal and vertical alignment. Several projects encountered unsuitable soils and required geotechnical engineering to bridge these materials, while minimizing the project costs. The Driesenga & Associates, Inc.â€™s (D&A) team provides geotechnical engineering, topographic survey, civil design, and materials testing services on these projects. Specific tasks include design engineering, soil borings, plan preparation, verification of pavement design, bidding documents, and opinion of probable cost to meet the requirements of the Allegan County Road Commission. We have also provided as needed materials testing of both on-site and laboratory testing for soils, concrete, and HMA. 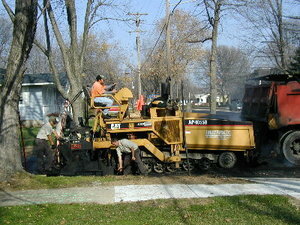 Project: Various Road Reconstruction Projects for the City of Holland, MI. Driesenga & Associates, Inc. (D&A) has provided complete design and construction engineering services on several road reconstruction projects. This work generally entailed completed removal and replacement of the existing road surface, reconstruction of existing sanitary sewer, water main, and storm sewer, installation of new sidewalk, curb and gutter, HMA surfacing and slope restoration. In addition to the complete design and construction engineering, D&A has assisted the City with topographic surveying, construction staking, materials testing, inspection, and construction contract administration. Sample projects are: 17th Street, 15th Street, 14th Street, 5th Street, 40th Street, Fairbanks Avenue, 8th Street, and Country Club Road. Work on these projects included the topographic survey, design, plan preparation, construction documents, opinion of probable cost, construction engineering and project management, construction staking, field inspection, and as-built drawings. Design and construction challenges include maintaining the existing sewer and water services during replacement of the utilities and avoiding conflicts with existing utilities in the older portions of the City neighborhoods. 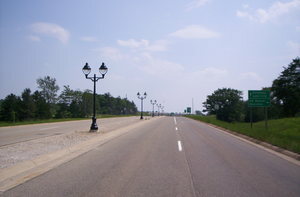 Due to the residential nature, it was usually required that the project be constructed while maintaining at least one usable lane at all times. Contract administration was completed with the use of MDOT FieldManager software. In order to create a more inviting business district on Mitchell Street on Cadillacâ€™s south side, the Clam Lake Township Downtown Development Authority began a street lighting project. The project consisted of twenty charming streetlights that now adorn the median at Exit 177 of US-131. The lighting project is the first phase, with future streetscape improvements planned by the Clam Lake Township Downtown Development Authority as Cadillac grows. Future enhancement plans include: sidewalks, pathways, landscaping and additional lighting. Driesenga & Associates, Inc.â€™s (D&A) work on this project included the design and preparation of construction drawings. These were developed in compliance with MDOT standards, specifications and procedures. D&A was also responsible for inspection services. Various Road Reconstruction Projects for the City of Holland, MI. Various Road Reconstruction Projects - Allegan County, MI.